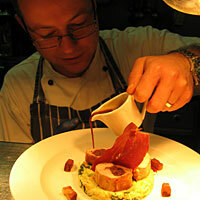 Justin Pilkington is Head Chef at Penmaenuchaf Hall, near Dolgellau. Your cooking style in a word (or two) : Modern British. Biggest influence : David McLoughlin (Head Chef at Holbeck Ghyll Country House Hotel, Windermere). Favourite local produce : Chanterelle mushrooms from Coed y Brenin Forest. Favourite dish : In Penmaenuchaf, roasted best end of Rhiwaedog lamb in a herb crumb with boulanger potatoes, aubergine caviar and a tomato and olive jus. Plain and simple at home - homemade chips, egg, bread and butter. Gordon Ramsey or Jamie Oliver? Gordon. Rowan Atkinson and Tony Robinson from Blackadder, the funniest comedy ever. Bodysgallen Hall and Spa, Llandudno. (I love Thai food. Don’t be put off by the name,it’s a great place).